In 2017, holiday gifters matched their shopping behavior to today’s on-the-go lifestyles like never before. Consumer expectations were high, and brands and retailers responded. The reimagined retail experience saw businesses optimizing brick-and-mortar locations with magic mirrors and virtual reality roller coasters, limited-edition merchandise, and Instagrammable in-store elements. Awesome shopping apps, helpful sales people and digital bots, and faster delivery options meant shoppers were able to research, browse, and buy products everywhere they went. 1. Holiday shopping starts as early as October. Last year, Walmart, Best Buy, and others started promoting deals in early November instead of waiting until the official Black Friday. That prompted a cascade effect that we’re sure will continue in 2018. Shoppers will be looking for deals not just in November, but in October, too. A rolling month of deals, instead of a specific day, presents a great opportunity. Especially for online shopping, offering a stellar deal will attract shoppers to your site earlier in the season. 2. Mobile becomes the go-to purchase channel. In 2017, more than 40% of all sales in November and December were made on mobile phones. This year, get ready for more than half of all holiday purchases to occur on mobile. Our Global Commerce Review from Q4 2017 unpacked comprehensive data that looked into the growth of mobile transactions. In most regions, for retailers with a shopping app, mobile now accounts for more than 50% of online transactions and in-app sales dominate. Based on current trends observed in 2018, we expect the share of mobile to keep increasing — especially the share of apps, for retailers who have one. Be prepared by making sure your website, app, and product pages are super responsive. Test them for speed, user experience, and ease of checkout. From Cyber Week to New Year’s, mobile commerce tends to peak in the pre- and after-work hours. Shoppers could be waking up and browsing or getting home and buying. During the work day, desktops reign supreme. Mobile shopping continues to dominate nights and weekends. 3. Cyber Week II is the best hidden opportunity. 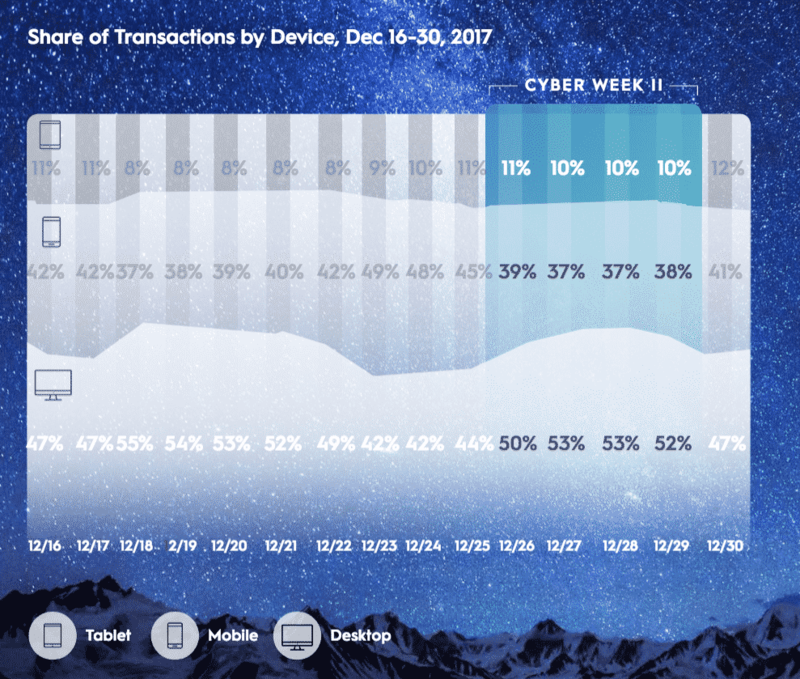 While no one could argue the impact of Black Friday, Cyber Monday, and Cyber Week, our data from Holiday 2017 revealed an unexpected opportunity in the US and UK — the week between Christmas and New Year’s, aka “Cyber Week II”. The UK, for example, saw a +28% AOV between December 26th (Boxing Day) and December 30th. December 25th (Christmas Day) marks the beginning of Cyber Week II, the period when shoppers flood back in market to take advantage of online deals. Gift cards in hand, they’re ready to treat themselves in the run-up to New Year’s Day. Be sure to keep your multi-pronged marketing tactics going to take advantage of impulse purchasing. Shoppers tend to be even more motivated by year-end deals, and inspired to spend on themselves to wrap up the (often stressful) holiday season. 4. Building more data means stronger customer relationships. If you can’t connect the dots for your shoppers, you can easily lose track of their journey. Last year, our Shopper Story 2017 found that, in most countries, shoppers value both online and retail experiences. In fact, 62% of shoppers said that they use their phones while they’re in-store. With mobile dominating the holiday season, it’s imperative for marketers to think about how to better connect with shoppers as they move across devices and channels. But most marketers aren’t exactly confident that they have winning data strategies. Research from Winterberry Group found that only 1.3% of marketers are “extremely confident” in their data strategies, with analytics being the most desired addition for most teams. Criteo Shopper Graph puts three types of shopper data together — identity, interest, and measurement — to understand what shoppers want. This approach for going around tech giants helps brands and retailers maintain control of customer data while gaining more insights, driving more results, and delivering more personalized experiences. This season, think outside the traditional holiday box — offer great deals as early as October, optimize your mobile presence, pay attention to the post-holiday opportunity, and use data to create the best possible customer experiences. For all the insights, including exclusive data and research, download our free holiday report.